How Tall A Handicap Toilet Should Be to Comply with Ada Standard? How Tall Is a Standard Handicap Toilet? A handicap toilet (some time also called accessible toilet) is for those who are physically disabled in some ways. The disability can be mobility or any other shortcomings which prevent to walk and move freely like an ordinary person. A handicap toilet provides greater access compared to ordinary toilets. For this reason, they are designed with larger space, handicap toilet bars, increased height and comfortable sitting arrangements. The increased height of handicap toilets is not only suitable for persons with a physical disability but also best for the tall and elderly people. So, the use of handicap toilet is not just limited to hospitals; rather it is widespread among households and other places. Standard handicap toilet refers to those handicap toilets which are compliant with ADA (The Americans with Disabilities Act) which was imposed in 1990. This standard provides enough guideline and requirements for any handicap toilet so that a person with disabilities can have proper access to the toilet. The standard includes increase height, positions of handicap toilet bars, availability of toilet paper holders and clearance in the front space. A standard handicap toilet can be both one-piece toilet and two-piece toilet. There is no restriction here. A standard regular toilet has a height of 14 inches to 16 inches measuring from the ground to the toilet seat. This is the required height for ordinary persons. Handicap toilets are little higher than these ordinary toilets. There are also other features of a handicap toilet which will remain missing in standard toilets. A handicapped person can still use an ordinary toilet, but they will lack proper accessibility and comfort. Along with other requirements, the height of a toilet is the most important and crucial factor for handicapped people. According to the ADA guideline, the height of a handicap toilet depends on the focused individuals. So, how tall is a handicap toilet? Read more to find the required height for a handicap toilet. According to the Americans with Disabilities Act (ADA), the maximum handicap toilet height needs to be 19 inches. The height is determined with the measurement from the floor to the handicap toilet seat. The lowest height can be the 17 inches measuring from ground to the seat. This might not seem significantly tall compared to the heights of ordinary toilets. However, these 2 to 3 inches may not seem a big difference but is sufficient enough to provide comfort for handicapped people as well tall people. As much as an adult person needs comfort and greater accessibility in a toilet, a child requires it too. According to ADA, if you are designing a toilet for the use of 3 years to 4 years old children, the top height should be no more than 12 inches. If the toilet is for children with the age of 5 to 8 years, the top height should be 15 inches, and if the age is 9 years to 12 years, the considerable height should be no more than 18 inches. Generally, it is hard to find standard handicap toilet for children as most handicap toilets are designed for adults. However, you can still provide your children to access ordinary toilets by providing a 2 to 4 inches sitting tool below the feet. Now, your child can sit comfortably. If you have no handicap toilet in your house but have one or more handicapped persons or child, they can still use the standard toilets if you make some adjustments. An ordinary toilet does not need to be discarded or replaced. With proper adjustment both handicapped adults and children can use it comfortably. For an adult handicapped person, use elevated seat or toilet seat riser to increase the height of the standard toilet seat. For handicapped children, install the platform underneath to lift the fixture to a necessary level. According to the ADA guideline, it is not the only height that differentiates an ordinary toilet from the standard handicap toilet, but there are also some other requirements. These requirements are designed to provide easier access to the handicapped persons. According to ADA, there must be a minimum of 48 inches space should be kept between the two side walls. To create proper approaching space, the toilet should be positioned at least 18 inches from any sidewall. The space required for front can vary, but the standard is to keep 66 inches from the back wall to the opposite wall of the toilet. The extra toilet space provides space for free movement as well as access to caregivers to move around along with the handicapped person. Handicap toilet bars or grab bars are very useful for the most type of handicapped person and this reason it is one of the ADA requirements for handicap toilets. Properly placed grab bars can prevent accidental injury with greater accessibility. Grab bars should be placed on both side walls and backside of the toilet. A handicap toilet seat with handles can also be useful in this aspect. The height of the handles or bars should be 33 inches to 36 inches from the floor. ADA guideline does not mention the required height for toilet paper holder, but specifies that it should be “within reach.” The flush should be automatic or manually operable with a single hand only. The handicap toilet seat should not be automated which spring ups automatically after use. Persons with physical disabilities require more accessibility and comfort to have pleasing living conditions. 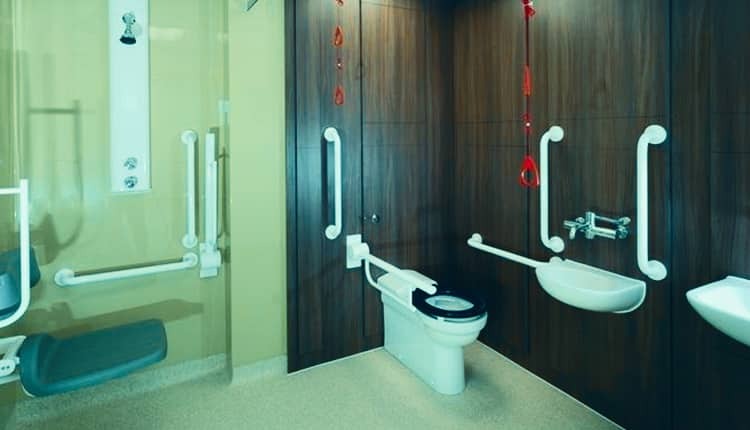 A standard handicap toilet not only provides greater accessibility but also provides comfort. By reading this article, we believe you have got sufficient idea about the required features and height of a standard handicap toilet and also how to adjust ordinary toilets for age-specific handicapped persons. Please feel free to write us back.